According to Hindu mythology, the Holy Trinity is the Trimurthi of Brahma (the Creator), Vishnu (the Preserver) and Shiva (the Destroyer). Having finished the business of creation, Brahma reportedly takes little interest in matters relating to day-to-day living and He is therefore very rarely invoked by devotees seeking solutions to their difficulties. That load is borne by the other two; therefore any public celebration will see Shiva and Vishnu being depicted in forms that are traditionally associated with them; Brahma gets to be seen very rarely, if at all. These deities are regarded as having their primary abodes in very specific locations. Shiva's seat is Mount Kailas (which is probably the only Himalayan peak that has not been climbed in deference to Hindu, as well as Tibetan and Buddhist, beliefs). Vishnu on the other hand lives in the Paalazhi (Kshira Sagar in Hindi), the infinite ocean of milk, lying on the coils of Anantha, the thousand-hooded Sesha Nag (divine serpent). Brahma is content to live on a lotus that grows out of Vishnu's navel. It would be considerably difficult if you had to see the three of them together - that panorama should stretch from the high reaches of the Himalayas to the ocean of milk and then again to the lofty heights where the lotus blooms. Not for the next few days, though. All you have to do is to go down Theyagaraya Road, towards Pondy Bazaar from Mount Road. You would have to have a will of iron to keep your eyes on the road - every passerby turns to take a quick glance at this representation of the Gods in residence! Why at this place? As far as I can remember, this end of Musiri Subramanian Road did not have anything to do with traditional dhobies (washermen). There is no evident water source nearby and I haven't actually seen anyone doing the laundry out in the open here. These bamboo poles are festooned with various clothes at any time of the day; as they are inside a fenced area, it is reasonable to assume that they are the laundry from the hostel of Vivekananda College. If so, why is it that every time I pass by, the laundry is dominated by white sheets? Have the hostel authorities deemed that such public display is allowed only for white sheets? And why this particular spot? Can't the sheets be sun-dried on the terraces of the hostel buildings? Musiri Subramanian Road is not exactly a sleepy little side-street, even if it is not a main traffic artery; it is very likely these white sheets would be tainted by the dust and exhaust churned around by traffic. And yet, it does not seem to affect them, these sheets remain untarnished for days. Whatever be the reasons, it is good to see one more of the surprising reminders of something that was commonplace a couple of decades ago - even if it does not cater to the general populace! Alliteration is so much a part of life in Chennai, so I couldn't help but doing it when I saw this strip of concrete with the mushroom like contraptions on them. It is evident that it is a waiting area of some kind; but my experience of Chennai has led me to believe that folks waiting for a bus to arrive would have some kind of shelter overhead. And then I remembered all those bus-stops in the 'mofusil' areas; they are bus stops because a couple of generations have grown up putting their hand out for the bus to stop there. There are no concrete structures, no signs, nothing. Just a convenient tamarind tree by the side of the road to protect the waiting passengers from the skies above. Santoshapuram, where I saw this, is most likely halfway house; it would like to think of itself as part of Chennai city, but hasn't yet been able to solve for all the amenties that are needed. Maybe they thought it is more important for people to take the weight off their feet - no guarantee of seats in the bus - than it is to shelter them. The budget for the bus-stop has therefore been used to provide these bar-stool like seating. Of course, people being optimists feel that it is more important to escape the sun than to rest their feet - the next bus will have enough seating, you see. And so, they find a nearby tree, wait in the shade, the bus stops there and these typewriter keyboard-like seats continue to dare you to come, sit down and feel the warmth of the sun. Whatever it may be, there seems to be someone who is determined to make a splash of colour at this bus-stop; that orange ribbon may be eye-catching, but it certainly won't make me wish to take shelter under it! I had heard of him and there was always an intent to watch the films he had made (at least some of them) . That intent became slightly stronger after Ingmar Bergman's death last year. Not being much of a movie buff otherwise, it was rather difficult translating intent into action. 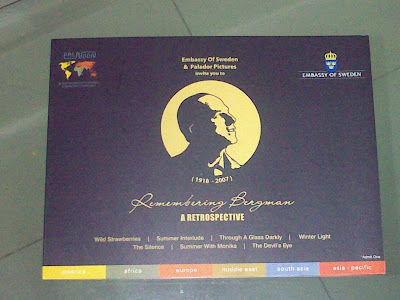 This month, a Bergman retrospective began its journey to 6 cities in India; Delhi and Kolkata have been done, today is the last day at Chennai. Bangalore is next, followed by Pune and Mumbai. As usual, I got around to it fairly late; missed the first 5 days, managed to go last evening and have all intentions of going today also. In some ways it was a slight disappointment; not the picture itself, but the whole retrospective bit. I'd imagined there would be some material about Bergman, the reason why the selection is representative of the man's work and maybe some talk about the film itself. It was however, a quick in-and-out show; fill up a form, take the pass, watch movie, return home. There were about 70 people who had turned up to watch Sommaren med Monika last evening. It was good to see people turning up to watch a film that was made 55 years ago; many of them seemed to be serious students of cinema and were bunching up together after the screening, probably discussing the nuances of the movie. It is possible that the timing of the show - 9.30 pm - didn't allow for more organized pre- or post-screening activities. The South Indian Film Chamber Hall, where the Retrospective is being held, has given over the prime time slot of 6.30 pm to hosting a Brazilian Film Festival. I wonder if that is being handled any differently, but really don't have the inclination to sit through a screening to find out! Looking back at 'Western' influences of childhood, it is very difficult to think of too many that haven't grown to be part of my life today - English itself, for starters; the 'western music thing', started off by hearing The Beatles and Elvis; playing cricket on the streets; all of those laid the base for ongoing interests. "Obviously" you say, "the ones that haven't stayed on have been forgotten! ": so what am I trying to prove here? Well, nothing much, if it comes to that, was trying to think of something that fascinated me as a child but did not stick on for much beyond that. That thought was spurred when saw these children practicing hard at a skating rink at the Anna Nagar Tower Park. There were about 25 of them doing the rounds under the watchful eyes of a coach (in blue t-shirt at the right edge of the picture). In the middle was a mother, helping her child with the skates and some others who were taking a breather. Quite a nice sight, but the surprising part was that there were so many onlookers around; a few of them were the casual, nothing-better-to-do-this-evening types, but many appeared to be regulars. There were some sounds of encouragement, a discussion on the sidelines about how one of the children had improved his speed and technique. There was a feeling of a community, bound together by these evenings in the park - one of the surprising spin-offs of encouraging outdoor sports - even skating. My attempts at roller-skating were usually on the sly upon the terrace of my grandfather's house. The rumbling of metal wheels overhead was guaranteed to get him riled up; it would have been a perfect way to wreck his mood and get him to come storming out of the house to the terrace. But the skates prevented quick getaways - the fun was to get him to chase, and never catch us! The contrast with a quiz that happened barely ten days ago couldn't be starker. The Landmark Quiz was held in a large auditorium, with cushioned seats, advance registration, assigned seating, coordinated lighting, visuals, slick presentations and tons of prize money. The Madras Quiz on the other hand was in a small hall tucked away inside Karpagambal Nagar, near Luz - finding the hall seemed to be an elimination round in itself, even with Google Maps. And then it was walk-in registration, find your seats, jump up to see the question on screen, have fun and fight it out to show off who knows more about Chennai - no prizes though, ladies and gentlemen, just the bragging rights. The teams that went up on 'stage' (a makeshift platform, actually) for the finals certainly deserved their bragging rights. A tough preliminary round sorted out all those who knew only parts of the City and the teams that went up knew a lot, from the names of the Chief Justice of the Madras High Court, the Commissioner of the Corporation of Chennai to that of the oil tanker which played a role in resolving the fuel crisis of July 1 and the location of the PK Srinivasan Maths Research Foundation. The finals saw some stiff competition before the winning team (VV Ramanan & Ramkumar Shankar) came through with a 1-answer margin. The point however, as Vincent D'Souza, the quizmaster and one of the founders of Madras Day said, was to create an interest and appreciation of the variety that Chennai city offers. And the variety was reflected in the events of this year's Madras Day celebrations - heritage walks, nature walks, photowalks, exhibitions, food festival, book releases, the Madras Musings lecture series - now that it is all over, I just can't wait for the next birthday party! One can drive up and down the Velachery-Tambaram Main Road for years without suspecting the presence of some wonderful natural riches by the side of that road. As you head to Tambaram, leaving Medavakkam behind, you will notice a grove of eucalyptus trees bordering the road. If you should look up slightly, just over the top of the trees, you will spot a small hillock in the distance. What we usually do not realize is that we are crossing the southern edge of the Nanmangalam Reserve Forest, a 320 hectare area of scrub jungle, surrounded on all sides by the newer real estate developments of Greater Chennai. On Sunday, we knew where to stop, because we were going for a short hike into the forest, a walk put together by the Madras Naturalists Society for the Madras Day celebrations. Though termed a 'forest', the area has very few trees; even the eucalyptus is an import from Australia. The vegetation here is scrub jungle, which once upon a time covered most of this part of the world. Bushes grow up to be about 6 feet tall and that's good enough to get lost in! The land rises slowly and then, all on a sudden, you get to a clearing and peer down into a granite quarry - one of three or four which were worked out and abandoned about a century ago. These days, rain water flowing down to collect in these quarries creates artificial lakes that shelter a variety of bird species, some lizards, small animals and a scores of insect species. The poster boy of the forest though is the Great Indian Horned Owl, which nests along the crags of the quarries and pretends to be supremely unconcerned with all the humans gushing at it. We did not get to see even one of those birds, but there was so much to see that we didn't mind tramping around through the scrub for a couple of hours. Scrub it may be, but it is still largely unspoilt wild land, coveted by quite a few. This guard shed with its complement of 2 guards is the bulwark against the forest being completely run over by poachers, petty criminals and land grabbers who are waiting for the slightest chance to get a toehold in! The Madras Day celebrations ended today and one of the last events was a book release; a compilation of essays by various authors on their impressions about Chennai. My first thoughts on listenting to the description of the book was that I must get around to reading it - it will be a challenge, but I know I must.... it has been a long while since I read a book in Tamizh, but this one sounds too good to be left unread, or even unsampled. One of the good parts of the Madras Day celebrations is that it has tried to reach out to places where these kind of celebrations are normally not taken to. It sometimes sounds much better hearing about impressions of Chennai in the native language! Tamizh is indeed a unique language. Evolving fairly independent of Sanskrit, Tamizh has been in use for at least 2000 years. The armies from this region took their language with them when on their campaigns into the island of Ceylon and to the Malayan peninsula; today, Tamizh is a national language not only of India, but also of Sri Lanka and Singapore. Though the dialects spoken in those countries is very distinct from those of India, it is quite easy to understand them if one has learnt Tamizh at school / college levels; however, someone who has picked up the langauge listening to the day-to-day exchanges in Chennai will be all at sea trying to figure out the meanings. Chennai Tamizh - naw, that doesn't sound right - 'Madras Bashai' is a mixture, a Tamizh base into which phrases from several other languages are thrown in and which must be spoken in a way that sounds like an invitation to arm-wrestle. If that has been your only exposure to the language so far, you are forgiven for wondering how could anyone make any sense of it. Which is probably the reason why, when the language became the first ever to be declared a 'Classical Language' in India, this Institute was set up in the city. We need to be reminded that the language is also part of a heritage that goes back a couple of millenia - and I'm sure next year's Madras Day celebrations will include some events to push that thought! Chandrachoodan (http://www.selectiveamnesia.org/) has been running a wonderful concept called 'Chennai Photowalks' for a while now. While it is normally once a month, he had organized three in the past few days, to celebrate The Madras Week. The last one was yesterday and I was determined to make it for this one, at least. By the time I reached the starting point - the Tower Park at Anna Nagar - I was late by 30 minutes. Having spoken to Chandrachoodan on the way, I knew that the walk would start off vertically, to climb the Visvesvarayya Tower and I could catch up with them at some altitude. As I got to the Tower, I found quite a few people who seemed to be lugging around fairly high-tech photography equipment and all of them were at sea level - turned out that we were too late to be allowed up the Tower. It was a disappointment, and I am sure it would have been a bigger one for the few who had come all the way from Bangalore to join in the Madras Day Photowalk. Anna Nagar, where this Tower Park is located, was the first - and probably the only - properly planned and laid out part of Chennai city. Until the late 1960s Nadukkarai (the middle bank - probably called so because the River Cooum makes a U turn around a piece of land), to the north of Poonamallee High Road was agricultural land. A trade fair held in Madras in 1968 was centred at Nadukkarai and that brought it to the attention of a lot of people who were looking for a quiet residential area close to the city. In a rare instance of long term planning, the whole area was laid out with straight roads, spaces for schools, parks, shopping and community facilities. And with all of this done, the locality was named after CN Annadurai, the first non-Congress Chief Minister of Tamil Nadu. Giving it such importance was necessary, for it was a challenge to attract people to come and live in this place - it was really the back of beyond. Surprisingly, considering the movie background of many of the state politicians, the one feature Anna Nagar lacks is a good cinema hall - if it had that, it would probably have declared its independence from Chennai - as this post suggests! Right from those times, the Bay of Bengal has been kind to Chennai. Even after the Port of Madras was built, the long stretch of sandy beach, the Marina, has remained largely unaltered - maybe it has extended just that little bit more into the sea. North of the Port, the areas of Royapuram, Tiruvottiyur, and Ennore have faced large scale erosion, and the sea has eaten up a good potion of the land, but south of the Port, the sands of the Marina probably remain as they were on August 22, 1639, when Day completed the transaction and was granted the firman to commence trading. Ignore some of the signs of the modern day on this photograph and you can almost convince yourself that those ships you see out in the 'Madras Roads' are merchantmen of the 17th century, waiting for the tide to rise for the masula boats to ferry their cargo from the newly established factory at Medrasapatnam.... Well, it is Madras Day after all, so let the imagination run free over the last 369 years! Setting up a hafta vasool racket in a Shropshire town and being expelled from three schools during one's early teenage years is normally predictive of behaviour that would end up with capital punishment. But an 18th century father's frustration led to this boy being sent off to India, to work with the British East India Company, sometime around his 18th birthday. And where does he land up but in Fort St. George, employed as a lowly clerk. With some good timing and street-smart skills picked up from the Shropshire market operations, this clerk showed signs of being a 'heaven-born general'. And so it came to pass that Robert Clive returned home in 1753, as a Captain of the army, with several exploits of derring-do credited to him. But the campaigns out of Fort St George had given him the craving for the soldierly life. He returned to India and was the key man in pushing the expansion of the British East India Company's interest not merely through trading, but through military action to take control of markets or, more possibly, factors of production. It was Robert Clive who brought Bengal into the British fold, laying the foundations to build the Company to become the power wielder of the sub-continent. But before he left Madras, he married Margeret Maskeylne; by this time, Clive was a legend even in Madras. The Governor threw open a newly constructed building for the newlyweds to live in for the short period between their marriage and their return to England. And thus did this building get it's name - Clive House! I wish I could say that all the Madras Week celebrations have been keeping me occupied, to the extent that today's post barely meets the deadline. Sadly, that's not the case; though I did have the opportunity yesterday to attend the re-release of Prof. KV Raman's book on the history of the Chennai region, upto the time of British occupation. To me, that has been one of the good things about this year's birthday celebrations - that there seems to be some more inquisitiveness about what this whole place was, before there was Madras. It is generally accepted that in the middle of the 17th century CE, there were a few villages around what is now Chennai, all of them vassals to whichever king had ascendency; these villages, like others of the day were all centered around a temple and were more or less entirely self-sufficient. Prof. Raman explores the history of these villages through the inscriptions found in these temples, and traces their history back to about the 9th century. But he doesn't stop there; he brings his considerable expertise to play in educating us about how the region around the city is a keysite for paleolithic settlements. Very early in this book, Prof. Raman throws Chennai's antiquity back to stone age times - Pallavaram, near the Chennai airport, is the first site in India where a paleolithic relic was found. With this kind of excitement being provided by a quick sampling of the book, I'm looking forward to more such as I read through it entirely. Prof. Raman could not have foreseen that there would be a gap of almost half-a-century before the second publication of this book of his. It just goes on to show the utter lack of studies about the pre-British history of this region. With the kind of support that the Madras Day has generated this year, it is likely that we will be seeing some competition to Prof. Raman's books - and it will not be a day too soon! When this flyover was being built, I'd hazarded the premise that the traffic around Panagal Park on Usman Road has thinned out. A couple of days ago, I was walking down that road to take a look at the completed flyover, which was inaugurated on August 14. I noticed a decent-sized traffic jam, the very thing that the flyover was expected to minimize. The reason? Many vehicles were skirting the flyover and several of them were pausing to let people off in front of the GRT showroom. Those that weren't interested in GRT's jewellery were possibly looking at going to the shops just beyond, and on Prakasam Road; there were others making a U-turn under the flyover to get at some other shops. I guess the story was very much the same at the other end of the flyover, for there was little traffic coming down it, too. I am sure there will be several explanations for the flyover not being used. Maybe people didn't know that the flyover is open for traffic; maybe they thought it was operating only one-way. Possibly, the weekend traffic does not need to use the flyover. Once the pavement shops are relocated, people will not need to crowd under the flyover. Whatever explanations are offered, I hope that none of them tries to claim it was unnecessary to have a flyover there! Even though Fort St George became the launch pad for the British Empire, it does not appear that the original intent of the Fort's construction was to use it for warlike purposes. The walls were meant to protect the British traders (and maybe the Portugese ones, too) and their merchandise from being plundered by their neighbours, native or European. The first buildings inside the Fort were the 'factory' for sorting and storing goods, the Governor's House, St. Mary's Church and houses for about 100 families who qualified to stay inside the 'White Town' of the Fort. As we've seen elsewhere, the French began to covet this Fort before long. Of those conflicts was born the need for the Fort to have its own ammunition store. So, after the Fort was recovered from the French in 1749, reconstruction included building the Grand Arsenal. Col. Patrick Ross, who was in-charge of redesigning the walls, also laid out the design for the Arsenal, with storage areas on the ground floor and living spaces above. John Sullivan's execution of this design survives to this day and at least partially, the Arsenal continues to be used as originally intended. We were allowed into the rear portion of the Arsenal thanks to Madras Day celebrations - these areas, occupied by the Army, are normally out-of-bounds for visitors. And so one got to see the words 'Madras' and 'Arsenal' together. If you were hoping to see something about the football club, sorry - it will take quite a few more Madras Days before the Gunners come to Chennai! In a sense, Fort St George is where it all began: the first capital of the British Empire, the founding of the city that would become Chennai Madras, the Boston Tea Party, the funding of Yale University.... with all such thoughts, the group gathered at the parking lot opposite the Fort. Dr S.Suresh, a consultant for INTACH (among other organizations), who led the walk, very quickly put to rest many of the 'where it all began' notions. As he reminded us, Mylapore finds mention in works going back over 2000 years; discovery of Roman coins on the Marina Beach indicates trade links in the 1st century BC. The constituent settlements of present-day Chennai were ruled by the Cholas, Pallavas and other dynasties; the British integrated all these settlements into one administrative unit. Still, the building of Fort St George did begin something new - and that is what we should keep in perspective when we think of Chennai's history. In the photo, Dr. Suresh is seen holding up a coin from the period when Chennai was first occupied by the Cholas. As the 50-odd people on this walk passed this coin around, trying to take photos showing the inscriptions on it clearly, I am sure Dr. Suresh had his heart in his mouth! There is a story about how James Daly, a theatre owner in Dublin went around one night scrawling the word 'Quiz?' on several walls of the city. By the next day, many people had seen this word and understood that it indicated some kind of test of knowledge; thus did Daly win on a bet that he could, overnight, introduce a new word into English! I'm not sure if this story is entirely true; if it were proven to be false, one reason could be that Daly scrawled the word not on the walls of Dublin, but on those of Madras. Where else can you hope to find over 2000 people gathering on a holiday afternoon to do nothing other than answer 40 questions (ranging from "Other than India, which two countries celebrate their Independence Day on August 15?" to "What would you find right on top of the Wimbledon Men's Singles Trophy?"). A large majority of them do it despite knowing that to be one of the 8 teams qualifying for the finals typically needs a score upwards of 30. That's the charm of the Landmark Quiz: they make you believe that you are only 2 points away from qualifying for the finals and then leave you knowing just that little more than when you started the quiz, though you would have ended scoring only 13 points! And therefore you come back the next year, because you know that if it is August 15, it must be the Landmark Quiz in Chennai. This is the 15th consecutive year of the Quiz; in that time it has grown to be India's largest open quiz, attracting teams from nearby cities. It has also moved and includes a Bangalore and a Pune edition too, with the top teams from these cities fighting it out in the National Finals (begun this year). Of course, that was won by a team from Chennai, who had qualified after travelling to Bangalore and winning the quiz there - with such a record, how can any other city claim to be the quiz capital of India? Until 2001, Independence Day was one of the two days on which citizens of India could display the National Flag. It is only over the past 7 years that people have had the right to fly the flag where they liked to (complying with the Flag Code, however). Still, the National Flag is predominantly seen only on top of government buildings. Even with the advantage of being placed on top of a building, very few flags can fly taller than this one; located inside the Fort St George, this is the tallest free-standing flagpole in India. At a height of 150 ft, the flag is constantly buffeted by the sea-winds - that's why it needs so many stays, to ensure it does not get blown over. I haven't been able to find any reliable information as to when it was first raised, but all indications are that the Union Jack was first raised on it in the late 17th century. The entire flag pole was made of teak and remained usable until 1994, when it was replaced with metal. As Chief Minister of Tamil Nadu hoists the flag here today, let me also wish everyone around a very happy Independence Day! During the 19th century, British power moved away from Madras and was concentrated at Delhi. Most of the agitations against British rule happened closer to that city, though many movements were pan-Indian in scope. In the Madras Presidency, there were quite a few leaders who not only exercised influence at a national level but were also key figures in organizing local resistance. One such was Subramania Bharati. A precocious poet, he went on to be a path-breaker and an inspiration for modernizing Tamil literature. He had the opportunity to travel around much of the country before he turned 20. His thinking broadened by his travels, Bharati railed against not just the British, but against various social inequities as well. A feminist ahead of his times, he ridiculed practices that did not allow women to participate more fully in matters of economics and politics. Bharati wrote not only for the older audience, but through his 'Songs for Toddlers', attempted to sensitise children at a very early age. Apart from his writings, he was also a vigourous supporter of various enterprises that thumbed their noses at the British and had to flee to Pondicherry, which was under French rule. Though he was later imprisoned for a short spell, Bharati was keen to stay out of jail to ensure that the various newspapers and magazines he published were uninterrupted, going so far as to swear off all political activities. This statue of his, on the Marina, is quite close to where he spent the last few years of his life. He died before he turned 40, penniless and friendless - mainly because he was seen as having succumbed to British pressure! Last week, I was invited to a rather unusual ceremony - distribution of schoolbags and footwear to about 720 children studying in several schools run by the Corporation of Chennai. Managed by the Education Department of the Corporation, these schools typically cater to the very-very-low-income segment, which means that keeping these children in the schools is itself a challenge. Despite not having to pay tuition fees, the children will have to incur expenses for other school supplies; sometimes, even a small sum of Rs.30/- (€ 0.48 or $ 0.71) for a geometry box is beyond their means. Now, these 720 children are further special: all of them are former child workers, who had been working at various establishments - roadside eateries, slaughterhouses or other unregulated industrial and commercial ventures - before being rehabilitated and admitted to the schools under the National Child Labour Projects. Many of their families are hard-hit by the loss of income the child used to generate, so some of these children continue to work outside school hours. Therefore, mainstreaming them also involves providing them incentives to stay in school; in this case, an NGO was able to raise funds from a multinational to procure schoolbags and footwear for these children (you can see some of those bags at the left of the photo, in the 3rd row). It was a humbling experience to watch these children as they waited for the others to arrive. Some were silent, but the majority were excited and cheerful as they tried to catch my eye and get a photo taken. As we lead up to our Independence Day, I'm glad to have had a small part to play in getting these children free to study! Where the Mahatma was ever for turning the other cheek, this man is reported to have said, "If someone slaps you on one cheek, you should slap both of his". With Gandhiji being unchallenged as the strategist for the Indian National Congress (INC), Netaji Subhas Chandra Bose's tenure as the President of that organization was marked by several disagreements between him and Gandhiji. Their differences were so marked that Gandhiji actively campaigned against Bose's election for a second term; however, there were quite a few in the INC who felt invigorated by Bose's call for violent resistance to the British rule, which ensured his re-election. It was a master-stroke of Gandhiji's that forced Bose to resign, not only as President, but from membership of the INC itself. Forming his own party, the All India Forward Bloc, Bose pushed forward his own vision of an independent India. As World War II loomed, Netaji, who had already served about a dozen prison sentences, was put under house arrest; the British rightly thought that he would try to take advantage of the political instability in Britain to mount a violent campaign for Indian independence. But the Netaji escaped and siding with the Axis powers, began to harass the British. Rallying the Indian National Army with his cry, "Give me blood, and I promise you freedom", he marched up through Burma to the North-East of India before the surrender of the Japanese cut off his supply lines. His final flight, from Rangoon to Tokyo, reportedly disappeared over Taipei: sixty-three years and at least 3 Commissions of Inquiry appointed by the Government of India have not left us any wiser as to how and where the Netaji died. While his choice of friends is questionable, there is no denying Netaji's commitment to democratic ideals, or his patriotism. So much so that a cry he popularised - "Jai Hind" ("Victory to India") - is commonly used even today. Madras had had little role to play in Netaji's life; but his name lives on in a road on which the Madras High Court, as well as several major commercial establishments (including Dare House) stand. And of course, there are several southerners in the 40 - 60 age group who answer to the typically Bengali surname of 'Bose'! As we head towards Independence Day (August 15), it is worth thinking about what might have been, had the French not traded away Madras for Cape Breton (Nova Scotia, Canada) at the treaty of Aix-la-Chapelle in 1748. Under Bertrand Francois LaBourdonnais, the French had captured Fort St. George in 1746 and had razed sections of the 'Black Town' outside the Fort. But the French diplomats thought Cape Breton to be a more lucrative prize and returned Madras to the British. The French military did not share this view and for the next decade, there were many efforts to take back the Fort (including comte de Lally's shelling from Parry's Corner). It was not until de Lally was defeated by Sir Eyre Coote at the great plains of Vandavasi (the Battle of Wandiwash, as it is called) that the French gave up their plans for Madras and concentrated on Pondicherry and their other, smaller possessions in India. Their interest in India continues in various forms, of which the most public is the Alliance Française, whose purpose is to spread French language and culture around the world. In Chennai, the Alliance Française of Madras was founded in 1953 and offers many services to achieve its purpose. One of the most efficient ways, the language courses, cover over 3000 students a year. The courses range from the 75-hour crash course to the 700-hour course that prepares you for the Diplôme de Langue examination. It's main centre, on College Road, not only houses the language classes, but also an amphitheatre, an auditorium, a small cafe, and a library / information centre. If things had turned out differently 260 years ago, it probably would be the British Council that is housed in this quiet building, trying to teach English in a predominantly French speaking Chennai! 'The Hindu', Chennai's venerable newspaper, has been bringing an annual week-long theatre festival to the city for four years now. Normally the plays are all in English, but this year's opening was a Korean adaptation of 'A Midsummer Night's Dream' (with English surtitles), probably in acknowledgement of Chennai's large population of Korean expats. The other new feature this year was a play produced by the Fest, in collaboration with the Goethe Institut, which premiered on August 3. Apart from the plays - which included productions from Mumbai, Bengaluru, Chandigarh and New York - the festival had a symposium on English Theatre in India, as well as a workshop on running a theatre company. Today is the last day of the festival; owing to a variety of reasons, I have not been able to watch even a single performance this year. I therefore had to be content with going to the Sir Venkatsubba Rao Concert Hall to take pictures of these off-stage props! With over 33 crore (that's 330 million) Gods, Hinduism has by convention, carved them up either geographically or by function - or even by just convenience of the worshipper. 'Bodyguard Muniswaran' for example, mainly blesses new vehicles. The goddess Mumba, while not very well known in many parts of India, has given her name to the city that was earlier Bombay. And each family typically has its own deity - but that doesn't tie each member down to just that one. Well, you get the picture. There are 'Gods on every street corner'. The street corner Gods have a fairly local jurisdiction, drawing worshippers only from the nearby houses. Then there are temples like the one in this picture; neither deity in this Ayyappan - Guruvayoorappan temple at Mahalingapuram is 'original', but represent the major Gods of the neighbouring state of Kerala - Ayyappan and Guruvayoorappan. As the capital of the Presidency, Madras was a magnet for people from regions that are in Kerala or in Andhra Pradesh today. The people stayed on and contributed their native architectural styles to the city's landscape. In Chennai alone, Ayyappan has at least four large temples dedicated to him, while Guruvayoorappan has at least two. That's certainly a lot of devotees! It has taken about 17 years to complete Chennai's Mass Rapid Transit System (MRTS) up to Velachery, its originally planned endpoint. The initial ideas were very grand; Chennai's MRTS would rival Singapore's similarly named system of urban transport; the system would be an integrated network with hubs where commuters could switch between rail and road; the rail coaches would be sleek - the dreams were many. Somewhere along the way though, the road diverged and MRTS became rail-alone. Still, one of the 'benefits' of the slow pace of work was that the design of each station could improve on that of the previous one. So, this station, where the MRTS begins to run parallel to the Old Mahabalipuram Road* (OMR) looks much sleeker than the ones built earlier. Thanks to the aluminium cladding, which complements the sleekness of the OMR and covers up for the fairly unaesthetic concrete blocks that were built first. The advertising panels at the station entrances also add to the with-it quotient. The station, following the norm, is named for the area in which it is located. And yet again there seems to have been a deviation from concept to commissioning. The area around it is Kasturba Nagar, named for Mahatma Gandhi's wife. But quite strangely, her name has been mangled and has come out differently in all three languages written here! *I guess I should start referring to it by its new name of Rajiv Gandhi Salai - but I still call this city 'Madras' sometimes! In some sense, India of the past worked on something like the 'open source' concept; there is no single person who can be credited with inventing chess, or the concept of the 'zero', both of which are generally accepted as having originated in this country. Intellectual Property (IP) was therefore one more of those quaint concepts that the British brought to India. The first legislation to protect such property was enacted as Act VI of 1856 and granted inventors some exclusivity for a 14-year period. In the nineteenth century itself, legislators brought out 4 different Acts, protecting inventions and designs and trying to ensure that inventors got some economic gains out of their work. During the twentieth century, the laws covering IP were periodically re-written, and were mostly ignored. Even the most significant legislation in this area, the Indian Copyright Act of 1957, probably lay gathering dust. The 1990s changed all that; the Copyright Act became the shield of choice for software companies as they sought to protect their work from being pirated. India's membership of the WTO in 1995 brought with it more seriousness about protecting IP - and also a lot of hue and cry about having to protect turmeric-based home remedies and basmati rice. With all of that, the CGPDTM - Controller General of Patents, Designs and Trade Marks - took on a more market-friendly brand of 'Intellectual Property India' and began to set up its exclusive offices in various cities. This building in Guindy houses the Chennai branches of the Patents Office and the Trade Marks Registry. It also has the only office of the Geographical Indications Registry in the country. Apart from all of this, Chennai and IP protection in India are very closely linked. The oldest firm of IP lawyers in India, DePenning & DePenning, is headquartered in Guindy, Chennai. It was born in 1856, soon after its founder, George Alfred DePenning, was awarded India Patent No.1 for his 'Efficient Punkah Pulling Machine'! To Ilango Adigal goes the credit for Silappadhikaram (Story of the Anklet), a rare epic that is rooted in the life of a commoner, rather than that of kings or Gods. And while the key plot points may themselves be rather mundane (even for the 2nd century CE, a husband's extra-marital relationship was not a shocker by itself), Ilango Adigal's genius lay in the grandeur of the epic. The story traversed all three - Chola, Pandya and Chera - kingdoms that spread over what is modern day Tamil Nadu; the narration integrates some of the best examples of prose, poetry and drama in Tamil literature and the characters he created are even today regarded as personifications of specific virtues - or vices. The story itself is simple: Kovalan, a merchant in the Chola kingdom, repents at having ignored his wife Kannagi for Madhavi, a dancer. Kannagi forgives her husband and they move to Madurai, the capital of the Pandya kingdom, hoping to make a fresh start. When Kovalan tries to sell Kannagi's anklet to raise capital, the jeweller sees an opportunity to keep the queen's anklet given to him; so he tells the Pandya king that he has captured a thief who tried to steal it. Ignoring the due process of justice, the king orders Kovalan executed; and he is. With all this happening on the very day they reached Madurai, Kannagi is furious. She proves her husband's innocence and lambasts the king, who, mortified at his error, falls dead. Kannagi's unappeased wrath sets the whole of Madurai on fire; her anger cooled, she goes to the Chera kingdom, where, broken-spirited, she dies and is deified as the epitome of purity. This statue on the Marina brings out the poet in Ilango Adigal by the palm-leaf manuscript in his left hand. The discarded crown and the sword on his right are reminders of his royal lineage. His appearance shows him to be the Buddhist monk that he eventually became. Inspite of abdicating all claims to the throne, this man has left behind a legacy that would be the envy of many kings! There were - and still are - very few professional theatre people in Chennai. For quite a few in the vernacular theatre circuit, it is a hobby; for others, it is a step to the screen, big or small. Tamil cinema has been fed by stage actors for about 60 of its 75 years - it is only over the past decade that its dependence on the stage has reduced. Also, very few of the actors, once they have a toehold in the movies, come back to the stage. With all that, the lure of the Tamil stage has been diminishing. As for English theatre, it was always seen as elitist; although the Madras Players, through more than 50 years of their existence have produced several Indian works (translated into English, of course), English theatre is restricted to a small group of fans. The Players, being mainly non-professional theatre folk, have had only a few shows of each of their 200-odd productions. Other groups - Masquerade, Boardwalkers, Little Theatre, Stagefright - have had short lives, or largely hibernating ones. About 5 years ago, a couple of graduates from MICA decided that Chennai offers the greatest market potential for high quality entertainment providers. Going off the beaten path of advertising / market-research jobs, they set up their event management company here. In the space of 5 years, their company, Evam Entertainment, has captured the imagination of the city with some remarkable marketing efforts. Some of the things Evam has done has brought theatre closer to the people: for example, a public announcement, like the one in the picture, for theatre workshop registrations was unheard of a few years ago. But now, it gives me a chance to go and try out my dramatic skills - and having done so, chances are that I'll go to watch Evam's productions for at least a couple of years, even if I'm booted out of the workshop! In a fair world, people should feel the same about this photo as they would when shown a picture of a python or a boa constricting its prey. The snake, however, works within our definition of 'real-time'; the strike, the stangulation, the wide opening of jaws and the swallowing of the hapless prey can all happen before our eyes without us getting much older. This tree works on a similar principle, but it is in no particular hurry. It's life probably began when a seed fell on the canopy of the palmyra. Over the course of a few days, the seed germinated, feeding on the detritus on which it fell. As it grew older, it began growing larger roots, looking for more food than the palm could provide; in a few months, the roots touched the ground. With a source of nourishment found, the tree began to grow bigger: more roots, more branches. In a few years, the palmyra finds itself being wrapped inside a maze of roots. Without meaning to, this tree's roots will crush the palm in... maybe a decade from now. It will take some really time-lapsed photography to show it happening in 'real-time' - and then we would dismiss it as a B-grade movie. The strangler figs (this one is Ficus bengalensis, if I'm right), though, do not mean to kill. They don't seek out living things for their seeds to fall on. You've probably seen some of them growing in a tiny crack of a building - or the well known images of the temples in Indonesia and Cambodia being crushed. This one though is probably a few centuries away from any building, standing as it does in a rather wild patch of scrub jungle behind - way behind - the Chennai airport! Yesterday, the traffic routing through Chamiers Road, Cenotaph Road and Mount Road was shuffled around a bit. This, they say, is the first step to building a flyover / grade separator (??! )at the entrance to Turnbulls Road. The flyover itself something that has been spoken about for a long time; initially planned on Chamiers Road, it has now been turned around 90-degrees and will take off from Cenotaph Road to land on Turnbulls Road. So, since last morning, both the 'C' Roads have been swarming with policemen. Basically, traffic is now one-way on both of them; The good thing - for me - is the opening of a right turn from Chamiers Road on to Cenotaph Road; while the latter is one-way towards Mount Road, the former runs in the other direction. Normally when a change like this is made, all of it is explained to each motorist, but there was a difference yesterday. Most of the policemen had these pink leaflets with them - despite the numerous mis-spellings, this is a good attempt by the Chennai City Traffic Police to document the changes it implements. I believe it is the first time that something like this is being done. The leaflet came in handy to convince a policeman that while I could not make a right turn from my street on to Cenotaph Road, there's nothing stopping me turning left into my street! It is a few hours before the first screening of a new film at Baby Albert. There are policemen - and policewomen - in uniform and in mufti around the gates of the cinema hall. The OB vans of national news channels are parked inside. As I get out of my car, I'm offered tickets for the movie - at about 15 times the box office rate. I walk around taking some photos and an Assistant Commissioner of Police grins at me: he is a fan too, and I think he must have pulled some strings to be posted in charge of operations here on Aug 1. In about 2 hours from now, the fans would be out in full strength. Before the movie begins, many of them would clamber on top of the 70-foot cutout of the hero and pour litres of milk over it, garland it, light camphor around it and do everything they can to let the world know that they are looking forward to this movie being a success. That's a decade-old practice whenever The Superstar's movies are released. In recent days, they have also begun holding blood donation camps, distributing free food and suchlike things to balance the mania with some meaning. And all of that did happen yesterday for this movie, not just in Chennai, but in Bangalore, Hyderabad and New Delhi, too. After all there's only one Superstar in India! The first of every month is marked as 'Theme Day' by the City Daily Photo bloggers. The moment the theme for August 2008 was announced, I knew I was going to post about this store on Pondy Bazaar, one of the shopping hot-spots of Chennai. Even though I have walked into this store several times, I am always amazed by the sheer variety of shapes and sizes of cooking - and storing - vessels that they have on display. You step off the pavement, right into the store and this is the sight that greets you, from floor to ceiling along three walls. In the middle, there are narrow aisles for walking through, and from the ceiling hang various kinds of vessels that have handles. Somewhere just overhead, there is just a small gap, where the stalactites and the stalagmites haven't met - yet. It seems to me that this is the way it must always have been, from the time Rathna Stores (Firm) opened for business more than 50 years ago. There would have been some change in the alloys: from the traditional cast iron and copper vessels through to aluminium - hindalium, especially - to the stainless steel and carbon steel vessels that are in vogue currently. The Firm has grown to provide you with everything that you would need for the house, including a whole lot of non-metal stuff. I can't believe that I missed registering for the 'Theme Day'! I knew the theme, I was sure what I was going to post about, but - I just didn't register to participate. That leaves me without the list of the 183 blogs that are participating, so you'll just have to click here to see their thumbnails - or you can just guess the theme for this month!